The Israeli occupation authorities prevented a Palestinian woman, from Bethlehem, from visiting her injured son Ibrahim al-Maghrabi who is currently held in an Israeli hospital, Haaretz Hebrew newspaper revealed. Al-Maghrabi who holds a blue identity card was arrested in Tel Aviv on Feb. 9, after a fight with a foreign worker from Eritrea. He was then held handcuffed in a police station where he tried to jump through the window. However, he suffered serious head and lung injuries. He underwent an urgent medical surgery at that time and he is still in critical condition to date. Despite his difficult health situation, al-Maghrabi’s arrest was renewed more than once. His mother has demanded to see him due to his critical condition; however, Israeli authorities refused to grant her permit. UNHRC member states told Israel moving towards ‘apartheid solution’ and cautioned against moving embassies to Jerusalem. 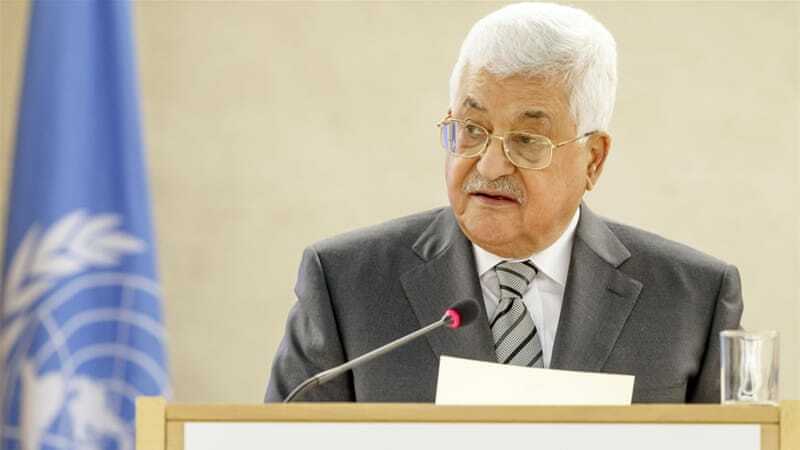 Geneva, Switzerland – Palestinian Authority President Mahmoud Abbas has called on the international community to defend the two-state solution in an address at the opening of the 34th session of the United Nations Human Rights Council. Abbas told member states on Monday that Israel was moving towards an “apartheid solution” in Palestine in light of a new Israeli law passed earlier this month that legalised dozens of Jewish-only settlement outposts built on private Palestinian land. He also cautioned states against moving their embassies in Israel to Jerusalem, in a warning seen as a direct response to promises made by US President Donald Trump during his campaign for the White House in which he threatened to move the US embassy from Tel Aviv to the divided holy city. “Palestine will remain the litmus test for this council … and whether it succeeds or not, will be crucial for the credibility of the human rights system throughout the world,” said Abbas. Abbas was the first of more than 100 dignitaries to speak at the “high-level segment” of this year’s session. The last and only time Abbas addressed the council was in 2015. The 34th session also marked first address to the UNHRC by Antonio Guterres, who began his tenure as the new UN secretary-general in January. After the three-day, high-level session, the council is expected to move on to issues such as the death penalty, racial profiling and incitement. “Palestine today is a truth, a reality anchored in history and the international system. It was recognised by the international community in 2012, 138 states have recognised it and its flag is raised at the United Nations,” he said. Israel has militarily occupied East Jerusalem, the West Bank, and the Gaza Strip since 1967, and has since facilitated the creation of hundreds of Jewish-only settlements across the occupied territories. While all settlements are considered illegal under international law, more than 100 outposts have been built without authorisation and are considered illegal by even the Israeli government. Abbas went on to reiterate his appeal for an “international protection regime” that would guarantee “the end of Israel’s occupation, the confiscation of land, the theft of water resources and the destruction of homes”. 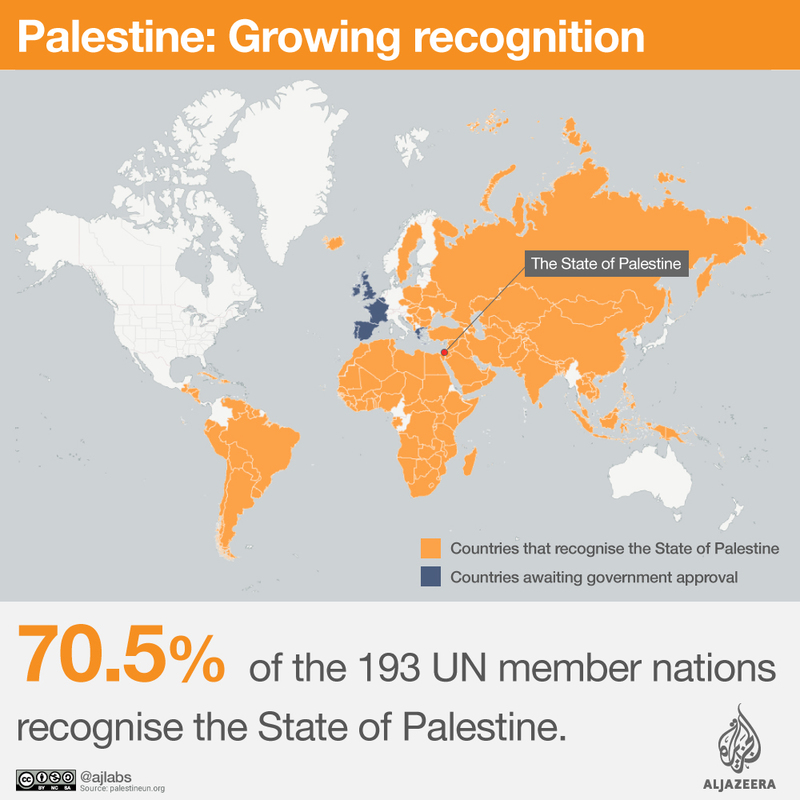 He called on states that have not done so to recognise officially the state of Palestine, and for the international community to come up with a precise timetable for an end to Israel’s occupation. Abbas’ speech at the UNHRC comes just weeks after President Donald Trump appeared to walk away from a long-standing US commitment to the two-state-solution. “Looking at two-state or one-state, I like the one that both parties like. I’m very happy with the one both parties like. I can live with either one,” Trump said during a joint press conference with Benjamin Netanyahu, I srael’s prime minister, in advance of their first official meeting at the White House. A two-state solution – the idea of Israel and Palestine living side-by-side and at peace – has been the bedrock of US diplomacy for the past two decades. Nikki Haley, the n ewly appointed US ambassador to the UN, quickly put out a statement saying the US “absolutely” supports a two-state-solution, but was looking for new ideas to push things forward. US-based outlet Politico reported on Saturday that the Trump administration was debating the idea of quitting the UNHRC over its alleged anti-Israeli bias. During this year’s session, the council is expected to receive at least three reports detailing allegations of Israeli human-rights abuses against Palestinians in East Jerusalem, the West Bank and the Gaza Strip. A separate report set to be submitted during this year’s session will focus on the Druze community in the Israeli-annexed Golan Heights, according to the Jerusalem Post. A resolution reiterating the UNHRC’s call for Israel to return the Golan Heights to Syria is expected by the end of this year’s session on March 24. Israel captured the Syrian Golan Heights during the 1967 Middle East war, and officially annexed it in 1981. Vice-president of the Syrian Coalition Abdul Hakim Bashar stressed that the Syrian Kurds are fully represented in the ranks of the opposition, adding that the rights of the Syrian Kurdish population cannot be regained as long as the Assad regime remains in power. Bashar said he was not optimistic about achieving a breakthrough in the current round of negotiations in Geneva due to the lack of a clear American position and vision for or a solution in Syria as well as the Assad regime’s tactics to scupper the negotiations. The Assad regime has always sought to sabotage negotiations as it is fully aware that to engage seriously in any political process would mean the beginning of the end, Bashar added. The Assad regime which has killed over half a million people; displaced 12 million; and detained hundreds of thousands of Syrians will not give up easily unless it is put under real pressure from the international community, Bashar added. He noted that the absence of an active US role has so far resulted in dire consequences for the Syrian people and the revolution. Bashar emphasized that the political and military battles fought by the Democratic Union Party (PYD) against ISIS in the provinces of Raqqa and Deir Ezzor have nothing to do with the Kurdish issue. He also said that Turkey is a friend of all the Syrian people contrary to what the PYD, which is the Syrian wing of the PKK, says. He said that Turkey currently hosts over 3 million Syrian refugees, including 300,000 to 400,000 Kurds who mostly fled the oppression of the PYD militias and are living in safely in Turkey, unlike the Kurds living in areas controlled by the PYD militias. 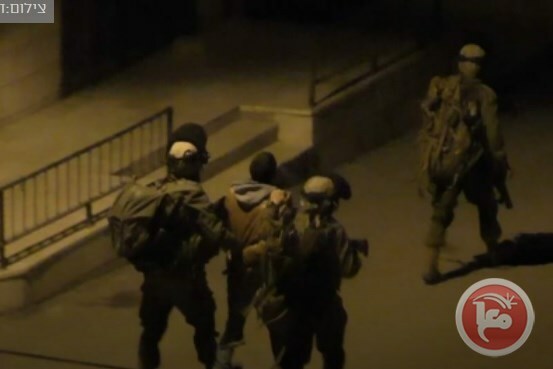 RAMALLAH (Ma’an) — Israeli forces detained at least 41 Palestinians in raids between Sunday night and early Monday morning across the occupied West Bank and in Israel, according to Palestinian and Israeli sources. An Israeli army spokesperson confirmed only 17 total detentions in the occupied West Bank, 13 of whom they said were detained for being suspected of involvement in “violent riots towards Israeli civilians,” while Israeli police confirmed the detention of 16 undocumented Palestinian workers in Israel. According to prisoners’ rights group Addameer, 6,500 Palestinians were being held in Israeli prisons as of January. Locals in the southernmost district of Hebron said detention raids were carried out in the villages of Nuba, Yatta, and al-Samu. Former female prisoner Ihsan Hassan Abd al-Fattah Dababsa, 35, was detained, after Israeli soldiers raided her house Nuba northwest of Hebron city. During a raid into the town of Yatta south of Hebron, Israeli forces detained the village council deputy Muhammad Mahmoud Ali Najajra, local sources told Ma’an. Coordinator of the Popular and National Committees Against the Wall and Settlements in the southern West Bank Ratb al-Jabour said that Israeli forces also raided a number of other homes in Yatta in the early morning hours, including the al-Harini family house, forcing residents to stay outside in the cold while soldiers searched the buildings. A statement released by the Palestinian Prisoner’s Society confirmed that Dababsa and Najajra were detained, and also recorded five other detainees from the Hebron area as 22-year-old Jihad Mahmoud Hmeidat, Maan Hamdallah Hmeidat, 22-year-old Muhammad Moussa Abu al-Rish, 17-year-old Musab Mahmoud Sweiti, and Nour al-Din Muhammad al-Hour. An Israeli army spokesperson confirmed three detentions in the Hebron district: one in the village of Surif, one in Beit Awwa, and one in Yatta. The Israeli army also claimed to have seized ammunition and weapons during the Yatta raid. In the Bethlehem district, Israeli forces detained 28-year-old Sanad Muhammad Hamamra and Ghassan Muhammad Hamamra, according to PPS. An Israeli army spokesperson confirmed four Palestinians were detained in the Bethlehem area: two in Husan, one in Bethlehem city, and one in Beit Sahour. In the central occupied West Bank district of Salfit, 21-year-old Bilal Abed Souf was detained from the village of Haris after Israeli forces raided his house after midnight and held all family members in one room, his father Abed Souf told Ma’an. Local sources said that 57-year-old Kamal Klib was also detained in Haris after Israeli soldiers raiding his house and shop, where fireworks were seized. Local sources said that 22-year-old Aysar Mumin Bouziya from the nearby village of Kifl Haris was also detained, identifying him as a student of al-Istiqlal University. The PPS statement confirmed the three detentions in Salfit, as did an Israeli army spokesperson. According to PPS, 16-year-old Saad Muhammad Naji Daoud and 33-year-old Muhammad Awwad Rawashda were detained near Ramallah. An Israeli army spokesperson also said one detention was made in the town of al-Eizariya near Jerusalem. In the northern district of Nablus, PPS said two Palestinians were detained, identified as 40-year-old Shadi Bashkar and Kamil Salama. An Israeli army spokesperson said there were four detentions in the Nablus area: one in Aqraba, two in Askar refugee camp, and one in the Masakin al-Shabiya area in Nablus. During raids in the district of Qalqiliya, 24-year-old Hamza Naim Hussein and 25-year-old Hamid Muhammad Salim were also detained, according to PPS. An Israeli army spokesperson confirmed one detention in the Qalqiliya area, saying it was carried out in Azzun. Israeli forces also detained 29-year-old Muhammad Salman Sarouji in the Tulkarem district and Ahmad Abu al-Amr from in the northernmost district of Jenin, the PPS statement said. Meanwhile, according to a statement from Israeli police spokesperson Luba al-Samri, 16 Palestinians were detained Monday morning in the industrial district of Raanana city in central Israel for not having permits required to live and work in the country. She said the Palestinians were residents of the occupied West Bank from Hebron, Beit Ula, and Qalqiliya, and that they were taken in for interrogation. A senior member of the Syrian opposition has confirmed during the Geneva talks that the delegation is in possession of visual evidence which confirms that the regime in Damascus has ties with Daesh, Al-Arabiya has reported. According to Colonel Fateh Hassoun, the involvement included the handing over of Tadmur to the extremist group. “The file will be handed over to the United Nations,” he announced. Hassoun had previously stated that the attack on Homs was executed by government forces, and that the opposition’s own evidence proves that there is a relationship between the regime and Daesh, and they are coordinating with one another. Moreover, Naser Al-Hariri, another member of the Syrian opposition delegation, accused the government group of trying to sabotage the talks. He added that the group consists of at least five people from Cairo and Moscow who are not listed by the High Negotiations Committee. Talks between the Syrian regime and opposition forces began last week at the United Nations in Geneva. Ramallah: Parents in Occupied East Jerusalem are defiantly holding classes for their boys in front of a Palestinian school ordered to shut down by Israeli authorities which accused it of teaching ‘incitement’. On Thursday, the Israeli Education Ministry, Jerusalem District Police and Shin Bet Security Agency shut down Al Nakhba elementary school. An appeal by the parents of the schoolchildren was rejected by the Israeli Higher Court of Justice on Sunday. According to the Israeli Education Ministry, the school’s curriculum was found to be ‘undermining to Israeli security’. Right-wing Education Minister Naftali Bennet warned that any school which teaches ‘incitement’ will be closed. The school has 250 students from kindergarten through sixth grade. The school’s principal, speaking to Gulf News, condemned the move. “We follow the same curriculum approved by the Palestinian Education Ministry,” Luay Bakeerat said. Bakeerat was arrested for continuing school operations when Israeli authorities tried to close the school down a few weeks ago. He was later released. For now, the parents of the students say they refuse to send their children to other schools in occupied East Jerusalem. Bakeerat praised the parents’ determination. “This is not new for Palestinians in the occupied city. We are banned from entering our own holy site, Al Haram Al Sharif, but Palestinians still worship outside the shrine’s boundaries,” he said. The families held protests in front of the school on Sunday and pledged to keep up their pressure until the decision is reversed. Since Israel captured the eastern part of Jerusalem in the 1967 Mideast war, it has attempted to force Palestinian schools to adopt the Israeli curriculum. In exchange, the Israeli regime promises to renovate existing facilities and furnish other facilities for occupied East Jerusalem schools. Israel also promises Palestinian students who attend these schools easier access to Israeli universities. Most recently, the occupation’s Jerusalem Affairs Ministry allocated a budget of $5m (Dh18.3 million) for schools which adopt the Israeli curriculum. The move comes amid escalated Israeli attempts to extend its control over occupied East Jerusalem. Palestinians say the regime wishes to erase all Palestinian and Muslim identity from the holy city. The Israeli regime wishes to make Occupied Jerusalem its capital — a move that Trump gave credence to when he promised to shift the American embassy from Tel Aviv to Occupied Jerusalem. He has since softened his statement and the White House said its ‘currently studying’ the move. At least four people have sustained injuries after Israeli military aircraft carried out a string of airstrikes on areas in the Gaza Strip in yet another act of aggression against the besieged Palestinian coastal territory. Gaza’s Health Ministry spokesman, Ashraf al-Qidra, said the four Palestinians were moderately injured when Israeli fighter jets struck Nahda neighborhood of the border town of Rafah on Monday afternoon, Arabic-language Quds Press news agency reported. Witnesses, speaking on condition of anonymity, said Israeli fighter jets had also fired two missiles at a military site belonging to the Hamas resistance movement — known as known as Shuhada (Martyrs) outpost– west of Nuseirat refugee camp just after 1 p.m. local time (1100 GMT). An Israeli unmanned aerial vehicle fired a missile at a monitoring post east of Rafah as well, with no immediate reports of casualties or damage. Shortly afterward, Israeli warplanes launched three missiles at Hitteen outpost in the city of Beit Lahia, located about five kilometers north of Gaza City. The airstrikes came shortly after the Israeli military claimed that a rocket fired from the Gaza Strip had hit an open area in southern occupied territories, but caused no injuries or damage. On February 9, Israeli warplanes targeted a lifeline tunnel in Rafah, leaving two Palestinians dead and five others injured. Gazans use the tunnels to bring basic commodities into the coastal enclave. Palestinian sources identified the deceased as 24-year-old Hessam Hamid al-Soufi and 38-year-old Mohammad Anwar al-Aqra’, both residents of Gaza City. Two Palestinians were also injured on February 6, when Israeli warplanes struck a farming land in the center of Khan Yunis city, located about 25 kilometers south of Gaza City. Israel has also launched several wars on the Palestinian sliver, the last of which began in early July 2014. The 50-day military aggression, which ended on August 26, 2014, killed nearly 2,200 Palestinians. Over 11,100 others were also wounded in the war. The head of the Popular Committee Against the Israeli Siege on Gaza said on Sunday that the occupation authorities have actually tightened the siege and added more items to the list of goods banned from entering the besieged enclave, Quds Net has reported. Jamal Al-Khodari pointed out that 500 items are now banned from being imported to the Gaza Strip. “The Israeli occupation is clearly targeting materials which contribute to creating work opportunities and achieving development in Gaza,” said the independent MP. This causes “paralysis” in the industrial sector. Al-Khodari told the media that the Israeli occupation interferes in “every single aspect of life” in the Gaza Strip through its control of all of the crossings into and out of the territory. All are closed completely, apart from Kerem Shalom for goods and Erez for people; they are only open partially, though. This, he added, doubles the suffering of the Palestinians who need to travel, including students and hospital patients. The MP ended his press release by saying that more than 5,000 economic ventures in Gaza have reduced their workforce due to the siege. Gaza has one of the highest unemployment rates in the world. Cairo – Several members of the Egyptian parliament demanded to check the country’s security plan against ISIS in north Sinai, in what seems a doubt of the government’s ability to end the attacks of the terrorist organization. The request comes after hundreds of Egypt’s Coptic Christians have fled the Sinai Peninsula following a number of killings in recent weeks by suspected militants. Speaker of the parliament refused the demanded saying that strategies are confidential and are not subject to any parliament in the world. Egypt’s Minister of Interior Magdy Abdel-Ghaffar defended his country’s security strategy on Sunday saying that the ministry has not asked any citizen to leave North Sinai. Since Friday, Christian families began leaving their homes in north Sinai after ISIS terrorists have shot and killed at least seven Christians in separate attacks in Sinai’s el-Arish city. Evangelical Church in the Suez Canal city of Ismailiya began receiving displaced citizens. The speaker pointed out that no parliament in the world demands its army to present a security plan to secure the area. He added that everyone in this world knows that the armed forces and police are fighting terrorism on behalf of the entire world. The speaker stressed that the parliament more than once stood a minute of silence for the martyrs of the police and army who lost their lives while fighting terrorism in difficult areas. He also mentioned that Minister of Social Solidarity, governor of Ismailia and a number of MPs visited the displaced civilians to see to their needs. MP Samah Saad said that the murder against the officers in Arish is part of the attacks against forces that have been happening for years now. She added that Coptic families should be secured against the attacks that threaten their religious identity. In addition, MP Margaret Azar said that terrorism targets both the army and the Coptic families. She added that Ministry of Housing promised to provide places to all families that were displaced. Azar demanded the armed forces to send messages of reassurance for the families in the area. Minister Abdel-Ghaffar held a meeting with top security officials on Sunday during which he said that the ministry has not asked any citizen to leave North Sinai. During the meeting, Abdel-Ghaffar said the ministry is responsible for the safety of all citizens across the whole state, including North Sinai, vowing to continue the fight against terrorism, sparing no effort. He praised the achievements of the security forces, stressing that the citizens should trust the forces’ capabilities to defend the country. Meanwhile, Prime Minister Sherif Ismail ordered the establishment of an operations room to coordinate the provision of services to the families. In addition, President Abdel Fattah el-Sisi hailed the “strategic and special” military relations with the United States. Presidential spokesperson Alaa Youssef said that Sisi met on Sunday General Joseph L. Votel, commander of the US Central Command (CENTCOM), in the presence of Egyptian Minister of Defense Sedki Sobhi and US ambassador to Egypt Robert S. Beercroft. The meeting tackled the latest security developments in the Middle East and international efforts to eradicate terrorism and ways to restore security and stability in the region. Both sides discussed several issues of common interest and ways to restore stability in the Middle East – in addition to increasing military cooperation in exchanging military expertise between the Egyptian armed forces and their American counterparts. Sisi emphasized the importance of strategic Egypt-US relations, namely in military cooperation, suggesting its expansion to face the parallel increase of extremism and terrorism threats to the region and the world. Sisi told Votel Egypt has, over the past three years, spared no effort in its fight against terrorism and extremism, Youssef added. The two countries are convinced that this is the perfect way to end conflicts, spare further bloodshed and restore peace and stability to the region. For his part, Votel described Egypt as “one of our most important partners in the region,” a statement by the US embassy said Sunday.